Gregor MacGregor, pictured above, was born in Scotland in 1786. At a young age, the Napoleonic Wars encapsulated his life and that of most others in Western Europe, and MacGregor began service in the British military starting in 1803, at age 16. For reasons unclear ended up in service to Portugal by 1811. A year later, he left Europe for Latin America, where new opportunities awaited. The Spanish foothold on the region had waned during the course of the Wars, and many nations in the region become independent sovereigns. This included the Principality of Poyais, which named MacGregor its cacique, or prince. 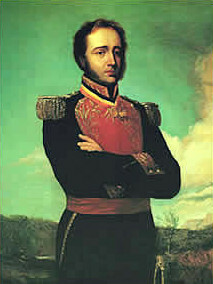 For most of MacGregor’s early years in Latin America, he bounced around in various military roles. He served as a colonel in the Venezuelan army in its war of independence against Spain and later joined the New Grenada (now Colombia) military in its fight for liberation. In 1817, he led a questionably-sanctioned group of War of 1812 vets in an attempt to drive the Spanish from Florida, too. (It failed.) He was generally well regarded as a soldier and military leader, although hardly a household name. Regardless, he appeared successful. In 1820, he returned to Great Britain, with news about Poyais, a new nation in the Americas which he was tapped to lead. Poyais was a relatively small nation it what is now Honduras. MacGregor described it as bountiful — rich in natural resources such as silver and gold, with easy access to the ocean. The indigenous people were not only friendly but helpful, assisting a small group of British settlers in developing the new nation. But Poyais needed more settlers and it needed a way to fund everything — so it needed investors. MacGregor had gone to London for exactly these reasons, and he found a populace looking for opportunities in the Latin America ripe for the picking. He sold over £200,000 in government bonds to investors — that’s about £16.4 million in today’s currency, or about $26.9 million — and sold plots of land to laborers for about a few days or weeks wages (sources differ). Two ships full of new settlers made their way to Poyais shortly thereafter. But when they arrived, they found something else. Or, rather, nothing else. No gold or silver mines. Natives who were ambivalent to Westerners, not helpful. And no British settlement, fledgling or otherwise. Just jungle. As the Economist so eloquently stated, MacGregor “had invented an entire country.” He was a fraud who just walked away with millions. Poyais didn’t exist, and never had. Bonus Fact: In more recent years, Honduras has been struggling with violence — by some measures, it leads the world with the most homicides per 100,000 people. One innovative yet strange way to curtail some of the violence? In late 2011, in hopes of limiting drive-by shootings, the nation’s legislature banned motorcyclists from driving with passengers on board. From the Archives: The Emperor: The man who would be king — in his own head. Related: “The Land That Never Was,” a 384 page book on Gregor MacGregor.